Post processing in Photoshop: Crop, Contrast, Hue/Saturation, Curves, Unsharp mask. Many thanks for votes and comments - much appreciated! Great use of the stark color. Very well done. Your title mentions skittles, but there are none?? 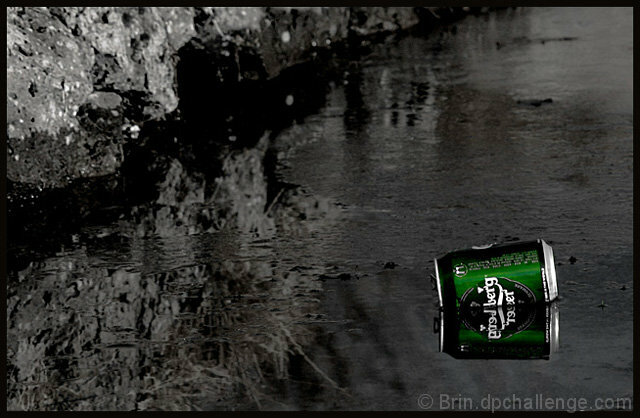 I like how you've isolated the green to bring the can as the focus. Nice. Good luck. Nice picture. Loves the reflection in the water and use of selective desaturation. Great use of desaturation and the can seems ideally placed within the frame. nice reflection capture! like how the desaturation calls attention to the can. assuming this was done with no region selections, congratulations! a great picture. Very good subject for desat - it really makes this picture stronger. Lucky it was the only green thing in the picture! Great composition. I really like the use of the selective desat, works really well here. The green is the focal point but still subtle. Proudly hosted by Sargasso Networks. Current Server Time: 04/26/2019 03:39:33 AM EDT.